1. All exhibitors must complete an entry form found in the back of the exhibitor book and mail to above address by the deadline to participate in voting for the People’s Choice Awards. No exceptions. Space is limited. 2. Tractors must be pre 1970. All tractors must be stock tractors. Tractors may have an implement attached to it. No modifieds allowed. This is a Peoples’ Choice Show Only. No more than two tractors per entrant will be allowed. The Chairmen reserve the right to adjust entries based on space available. 3. Juniors must be 16 years old or younger. 4. No exhibitor can win more than 3 years in a row in any one division giving other exhibitors a chance since this is a People’s Choice Show. 5. Each tractor will have a number and it’s information as provided on the entry form posted by it for voting purposes. All tractors must be in place on Thursday September 20, by 10:00 PM and remain in place until 7:00 PM Sunday September 23. NOTE: The Guilford Agricultural Society Inc, its officers, directors, members and/or volunteers will not be held responsible for any damage. Security will be on the grounds at all weekend. Tractors will be roped off. All entrants must pay admission at the gate during the fair. 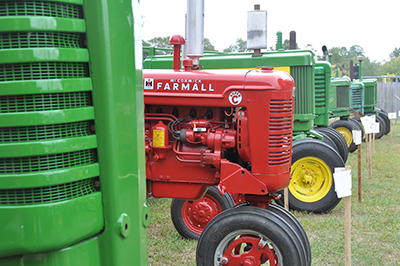 A ballot box will be put out for the public to place their votes for their favorite tractor. On Sunday, September 23, approximately 3 PM the ballot box will be removed and all ballots counted. Awards will be presented/announced at approximately 4 PM.